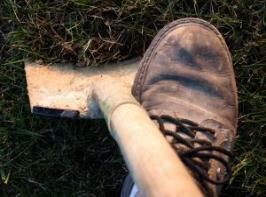 Do you know the difference between dirt and soil? Peat moss and sphagnum? understand what you read and hear. and dynamic, with many microorganisms that help plants to grow. comes to ability to drain, hold air, and other physical properties of soil. ingredients) that perform well in pots. Compost breaks down through the season, so should be replenished yearly. tea bag, in water to release some of its benefits that can be watered onto plants. These benefits are being researched, and may include disease suppression. Perlite is from a volcanic ore that has been broken up and expanded by heating. but some such as azaleas and blueberries like it even more acid. burning plants if overdone) "hydrated" limestone is used. Then when buying fertilizers you'll need to decide whether to use "organic"
ones derived from natural ingredients such as fish, bones, or minerals. "Synthetic" fertilizers are those made by humans, synthesized from chemicals. as the organic ones consist of chemicals too, just naturally-derived. used for containers and heavy feeding annual flowers.